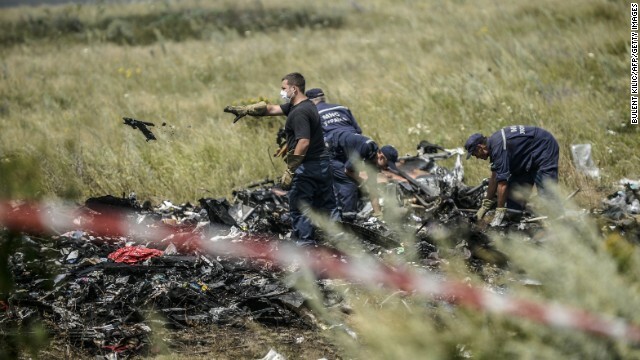 Ukrainian State Emergency Service employees sort through debris of MH17 on Sunday as they try to find the deceased. The crisis surrounding a passenger jet shot down over Ukraine intensifies, Israelis and Palestinians get further tangled in violence, and the Queen's royal guards prove they do actually have a sense of humor. Welcome to the Monday edition of “5 Things to Know for Your New Day." Every weekday morning around 6, we’ll hit the top five stories of the day and clue you in on a few other buzzy items. Can this get worse? Apparently, yes. The families of 298 people whose plane was shot down over eastern Ukraine must now grapple with more terrible news: claims that separatists have looted from the crash scene, tampered with evidence and prevented investigators from getting to the site. All the while, more than 200 of the bodies sit in refrigerated train cars. The next challenges: Trying to confirm who shot down the plane and figuring out if devices found by rebels are actually the "black boxes." Game changer? The battle between Israel and Hamas militants in Gaza is getting bloodier by the day. At least 87 Palestinians and 13 Israeli soldiers were killed Sunday in the deadliest day of the current conflict. And now Hamas says it's captured an Israeli soldier, which an Israeli official denies. U.S. Secretary of State John Kerry heads Egypt today to see what he can do to get a cease-fire going. The question is, will both Israel and Hamas actually stop the violence? So close: Bill Clinton said he was thisclose to getting Israelis and Palestinians to stop fighting each other back when he was in office. Now, 14 years later, he tells CNN's Anna Coren what it would take to achieve peace on both sides. That's not all. In a wide-ranging interview airing this morning on "New Day," Clinton also talks about the surge of unaccompanied children crossing into the U.S., the future of Ukraine and the U.S. role in Iraq. Syria or bust: In this case, it was bust. A 20-year-old California man is headed to court today after, authorities say, he wanted to go to Syria to join ISIS, the radical Islamist group taking over swaths of Syria and Iraq. According to the feds, Adam Dandach said he "would assist ISIS with anything the ISIS asked him to do, and that he believed the killings of U.S. soldiers are justified killings." We'll see what Dandach has to say in court. "Troubling" video: Eric Garner had both hands in the air as New York police officers were trying to arrest him. Yet one NYPD cop grabbed him in a prohibited chokehold. Soon afterward, Garner was dead. Now Garner's friends and family are incensed by what happened, and New York's mayor says the video is "very troubling." But a police organization says the officer should be given the benefit of the doubt. Game of Real Thrones: And you thought the Queen's guards were too stuffy to have a sense of humor. During one changing of the guards, the stoic defenders surprised everyone by playing the theme song of "Game of Thrones." "The Rock" plays patty cake. While dressed as Hercules. That is all. Awww: Dog steals toy from baby girl. Baby starts wailing in sadness. Dog, apparently filled with guilt, decides to apologize by overwhelming the baby with toys. Now if only humans could be this sweet when they do wrong. That drop dead, good looking, gorgeous, beautiful hunk of a man namely " The Rock" can play patty cake dressed or undressed as Hercules or whoever his heart desires with me anytime!!!!!!!! LOL!!!!!!!! Needed something this New Day morning to make me smile!!!!!!!! Thanks!!!!!!!! So Margaret, tell us how you really feel about Dwayne Johnson AKA The Rock, LOL!